So I'm starting to fall in love with the current printed trousers trends. They're perfect for any season and look great in a fitted form that clings to your curves. Whether it's a print, polka dots, or a floral pattern, I love them all, and they're popping up in stores everywhere. Even though I live in Florida, and sometimes pants are sticky and hot, a cropped pant that hits the mid-calf can still work in the summer heat. And if you're not a pants person, printed shorts and just as bold and amazing. Pair them with a plain white t-shirt, oxford, or complimenting color and you've got a bold, but very polished look! 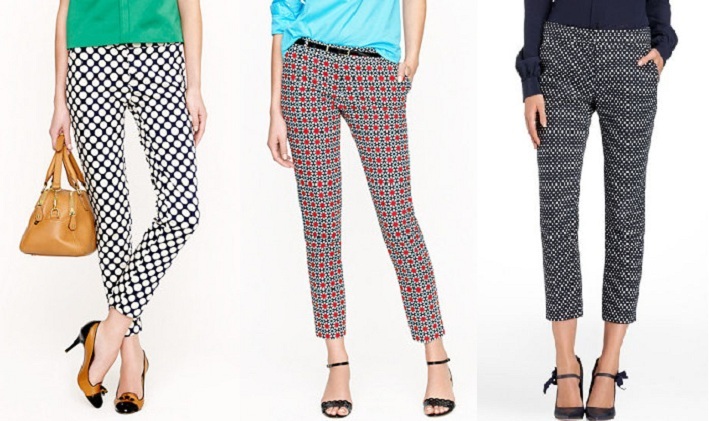 Do you love the printed trouser trend? What's your favorite print to wear?